Five months ago Kelly and I met at a Godspa Retreat. The purpose of Godspa is primarily for personal, reflective and quiet time with the Lord. Everyone came together for lunch and Kelly and I got to talking about art. I saw some of her work and was astounded. We exchanged phone numbers and became Facebook friends. In the short time I have known her, God has really poured into her and she is pouring out. When I meet someone this amazing I want to share her with everyone I know, so here she is Kelly Lee Blankenship, the Unsuspected Artist. Redemption's Champion (RC): Tell me a little about your artistic journey? When did you know you loved to paint? What forms of art did you start with? Unsuspected Artist (UA): I have always loved art. I drew and wrote poetry as a child. I played with acrylic paint as I got older for fun mostly. In the past 2 years, I paint with anything that will go in my hand. No one was more surprised than me that I would be doing this today. I still struggle with fear of judgment. RC: When were told that you were a prophetic artist and what was the setting? UA: My husband and I were in the car on the way to a Christian concert with our pastor. He said that God showed him I was supposed to be involved in worship and asked if I could sing. I laughed. Then he said it must be prophetic art then. He showed me a video of a worship artist painting in the prophetic and a flame began to grow inside of me. I still haven't been able to get on stage during worship to paint but maybe one day. RC: You mentioned in one of your videos that when you were prophesied over and told you were a prophetic artist, but you didn’t even know what that meant? It is quite obvious you have figured it out, how has the Lord instructed you since then? UA: He has shown me that my atmosphere and heart has to be focused on Him. I have a special place in my home that is set aside just for praying and painting. I usually turn on worship music loud (to drown out my singing) and open my bible. Most of the time I have no idea what I am doing and just wait for God to show me images in my head. I have also learned to take my history of doodling during sermons and focus it on what God is telling me through the sermon. RC: What does the life of a prophetic artist look like day to day? I know you have a husband and children? What is your husband’s name and your children’s names and ages? UA: I have a wonderful husband, Eric and three amazing children, EJ, Kara, and Laci. We serve in our church and I have a great career. With all that I have going on in my life, often I have to make sacrifices in other areas, like sleep, to focus on what God wants to show me. I end up blushing a lot because of the attention but in the end, the glory goes to God. 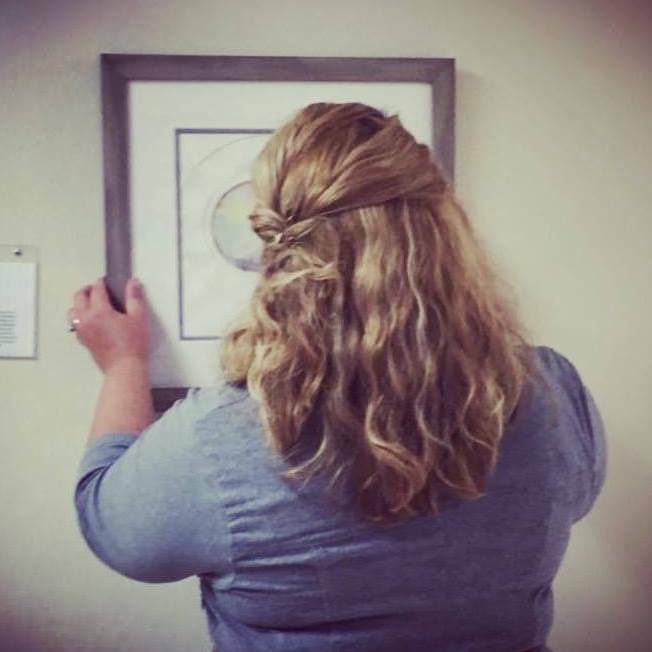 RC: How did your art end up at the hospital where you work? UA: Since beginning to paint for God I had rarely shown my paintings outside of the church. I was fearful of rejection and judgment. He convicted me that my worship, my painting was my candle. It was made to bring Him glory in and outside of the church. He challenged me to step outside of my comfort zone and put His gift in front of the world and share His word. I looked into my local art alliance and joined. I read that they had an art exhibit coming up that just so happened to be at the hospital I worked at. I entered, barely expecting to get accepted, and BAM! God showed up and showed out. Here I was at the exhibit 4 weeks later, youngest one there, with everyone in my family and several coworkers coming to support me. I was terrified but God had different, amazing plans for me. RC: If someone loves art or just loves to create, where would you recommend they start to develop their gift and talent and discover how the Lord wants to use it? UA: Take everything you think you know about your ability or what you have done in the past and throw it out the window. 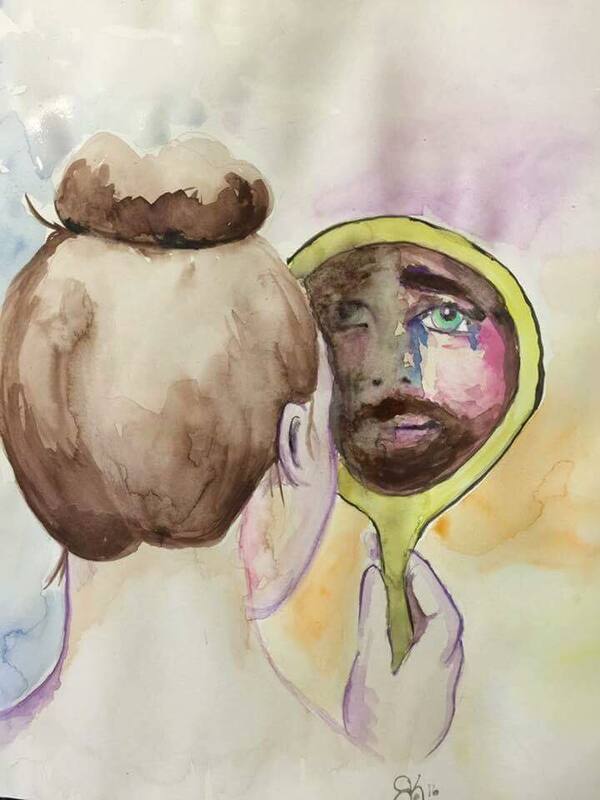 Before Christ, my art was meaningless and mediocre. Now it is my purpose. Whether you go to a blank canvas with no plans or with an idea of what you are going to start with, you have to prepare your heart and go to God for guidance. He is the one doing the work. Usually, I look at a painting with surprise myself, like, holy moly Kelly you just did that?! RC: Does someone need to be professionally trained to do what you do? UA: Absolutely not. I have taken two art beginner drawing classes in college, they weren't even for painting. I am not a professionally trained artist in any way and typically I have not idea what I am doing. If you hear one thing from me it is to put aside these preconceived notions and perceived requirements because they have no place in the kingdom of God. God only needs a ready heart to make a masterpiece! RC: What is your favorite thing about painting? UA: I don't have one favorite thing about painting. If I had to answer I would say three things: 1) to see what it looks like when it's over. I need to know if a painting will turn out perfect or need second take. 2) the process of getting lost in prayer and song. Some paintings take 15 minutes while others take several hours. Once I start I don't usually get up until I am finished or too tired to keep going. 3) I love to see how the paintings touch others. 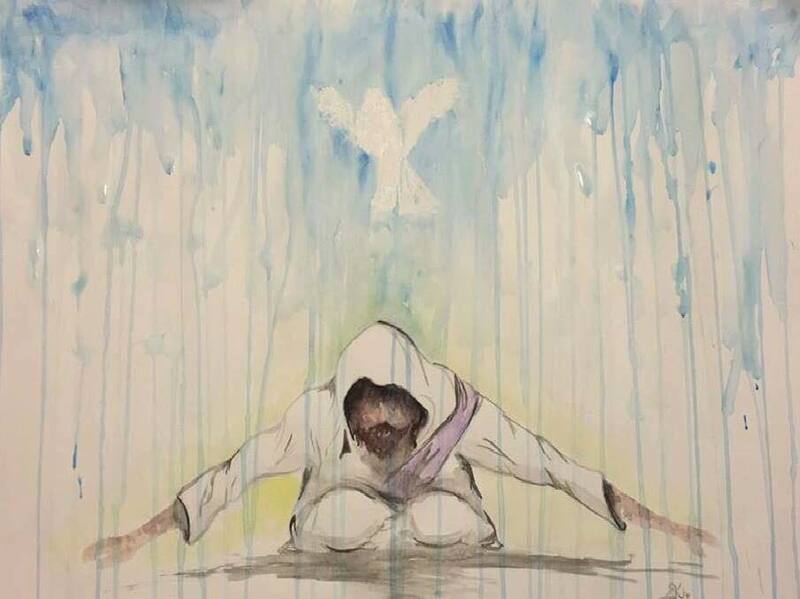 I rarely know who the painting is meant for but when I see the responses from others it is confirmation that I am obeying God in my worship. You can find Kelly on her website and Facebook. All of these are for sale on her website. Great news, Kelly has agreed to do a custom piece for Redemption's Champion. I will be giving it away when the blog hits 5,000 views, stay tuned, we are close.